The RT simulation module allows simulating a radiographic control by taking into account the different radiation produced by X or gamma ray sources. From the simplicity of handling the CIVA interface, the user can easily and quickly set-up its configuration: Selection of the part to be inspected, definition and positioning of the source and the detector, insertion one or several flaws, definition of calculation options. 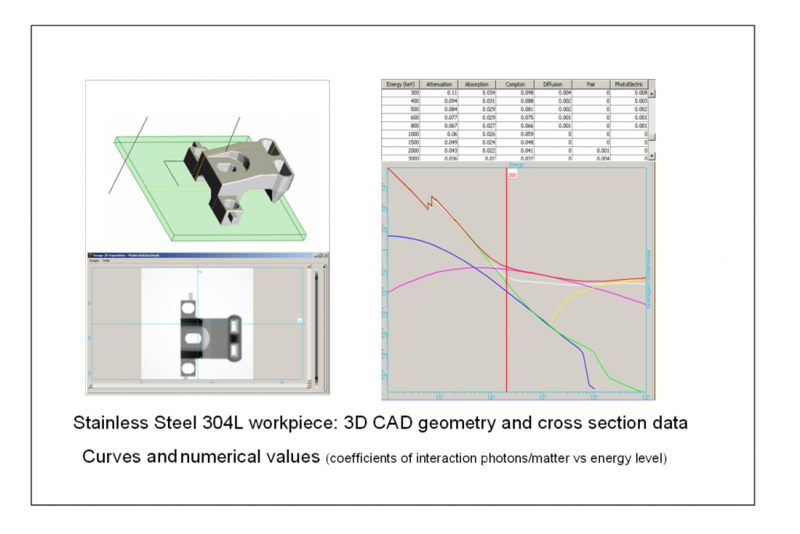 2D profiles can be drawn or imported in CIVA (DXF format). The generation of the 3D geometry is effected by translation or by rotation of the profile. It may be homogeneous or heterogeneous. 3D CAD files (STL, IGES or STEP) can be imported in CIVA. Several volumes can be imported simultaneously allowing to model complex geometries. CIVA allows to export specimens modeled in IGES format. A library including over 110 elements and alloys is available in CIVA. The user can define, his own alloy by knowing the chemical composition of it. The new alloy can be named and saved for future use in CIVA. The component can be homogeneous (one material) or heterogeneous. Gamma-ray sources: The activity of the source must be defined together with the radioisotope used. The classically sources used in NDT are already predefined: Cobalt 60, Iridium 192 and Selenium 75. Other sources can be added and saved in the library CIVA sources. 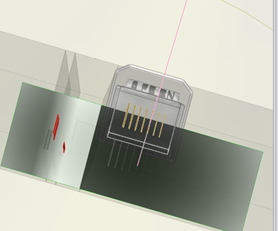 High energies sources: Since CIVA 2016, a library of high energies spectra (linear accelerator and betatrons) is available in CIVA RT. For X-ray and high energies sources, the user can add a filter to spectra. Emission zone: It is possible to limit the effective zone of radiation in space with a conical or cylindrical volume. The effective size of the source (anode target with X-rays, radioactive capsule in Gamma) can be assumed as an ideal spot or not, allowing to account for geometrical unsharpness. CIVA allows to model either digital and conventional radiography from libraries (based among others on the NF EN 11699-1 standard for silver films) or experimental data. Digital detectors type "flat panel"
A detector can be defined by simply keying-in its response in term of grayscale (or OD) in relation to a measured incident dose. The detectors can be flat or curved, front and back filters can be added. The detector noise or the granularity of the silver film can be taken into account. An MTF curve can be added for each type of detector. 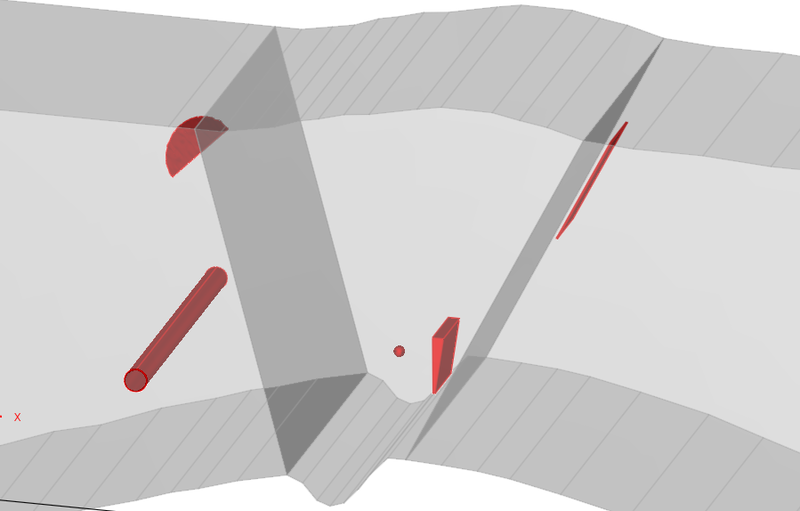 A region of interest (ROI) can be used to over-sample the resolution of the computation at one part of the detector. The radioactivity emitted by a specimen to be inspected can be taken into account since CIVA 2106 by selecting the “Contact Dose Rate” option available for silver films. During the computation, this dose rate value will be added to the one emitted by the source modifying the result obtained. Several flaws can be inserted in the test piece. They can have different shapes: planar, spherical, ellipsoidal, trapezoidal, or an arbitrary 3D CAD geometry. The same list of materials as for the specimen can be assigned for flaws. 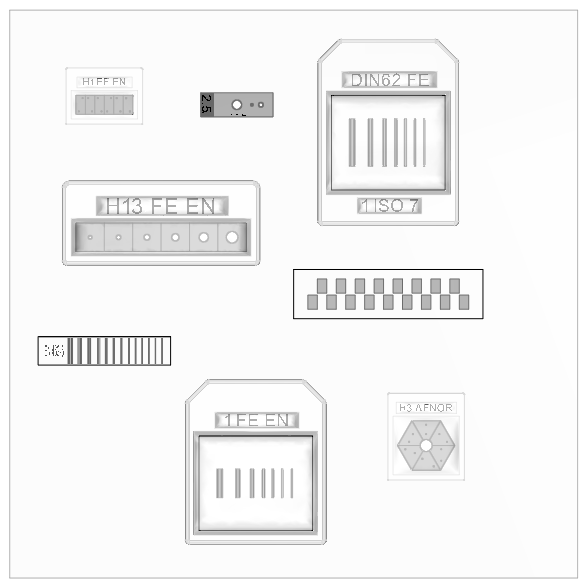 A library of the main standard penetrameters (based on EN, ASTM, AFNOR, DIN62, and CERL norms) is included in CIVA: wire (simple or duplex), holes, step wedge, etc. Two combined methods (analytical Beer-Lambert & Monte-Carlo) compute both the direct radiation and the scattered radiation. The build-up (ratio direct/scattered) is also available in order to estimate the importance of scattering in a given inspection. A scenario of parametric variations can be defined. For Monte-Carlo computations, the algorithms benefit from multi-core architectures in order to reduce computation times. Moreover, if this computation has been performed once, and the user wishes to study the variation of a parameter that does not impact the scattering (variation of the exposure time for instance), the Monte-Carlo can be re-used in the new configuration and associated with a new and fast direct computation. CIVA includes a tool that will automatically provide the estimated number of photons for a good convergence of the Monte-Carlo simulation. The user can visualize both the detector response (optical density or grey levels) as well as the incident dose in Gy or the deposited energy on the detector in keV. 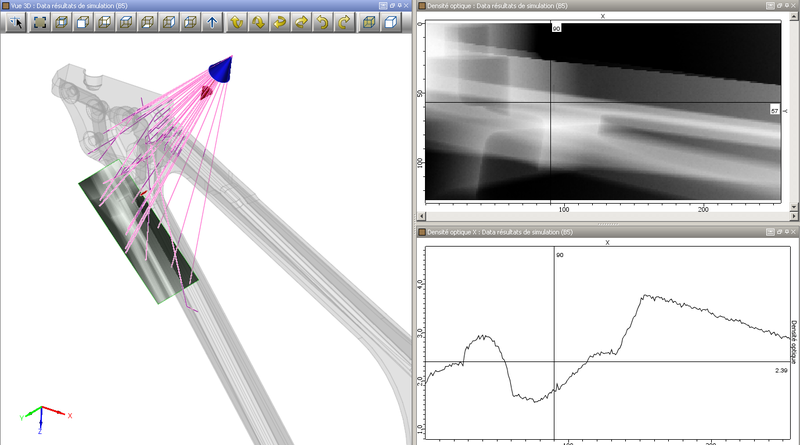 The results are presented as images in the classical CIVA environment as well as curves following selected cross sections, allowing the user to easily quantify local variations of contrast. The cursors are dynamically linked to the 3D graphic view, and the photons paths are plotted. The thicknesses of materials passed through are identified in a table. The images obtained can be exported in Tiff or raw format. POD computations (Probability Of Detection) are also now available in the RT module, based on the accounting of uncertain input parameters. Post-processing capabilities are offered to the user, who can quickly re-calculate the activity of the gamma-ray source, the intensity of the X-ray source, or the relevant exposure time necessary to reach a targeted optical density (or response of detector). In the same way, the optical density (or response of detecor) can be quickly recalculated if these 3 parameters change. Some detectability criteria based on the smallest surface interpretable by the eyes have been implemented. These criteria will help the user to predict the flaw detectability. The detectability analysis is available for any simulations in CIVA RT.